Yi Jing is the Chinese book of Wisdom. It is like the Proverbs of the Bible. However, unlike proverbs, Yi Jing is highly organized into a graphical taxonomy. I hope someone will be able to create a taxonomy of proverbs wisdom before me. Someone says that a leader must have 3 things – moral character, capability and wisdom. Wisdom is not a static thing. Wisdom is the ability to perceive a situation, and apply the right knowledge in the right way at the right time to resolve a crisis or make a bad situation good. Of course, wisdom will tell you that your need good moral character and ability. So I Ching (Yi Jing) stresses on understanding the timing (时), the positioning (位), and then deciding on the right action from the knowledge base of wisdom(Yi Jing). Life is a harmonious interacting cycles of changes of situations (positions) that follows patterns put in order by the creator. Lack of harmonious interaction will bring forth blockage, fight, decay, crisis, war, disasters and sickness. Breaking the rules determined by the creator will leads to danger and destruction. The theology of Yi is that the universe is created by God and there is a order, the Dao (the Way) of the universe. The 3 key elements are the Heaven (God, 天）， the earth (地) and man (人). Man must learn and follow the ways of the Heaven and the Earth (the natural environment). Violating the orders will bring disasters (think Global warming & pollutions). For man to live a joyful, rich and long life on earth, man must know the ways of the Heaven and Earth and live in harmony with them. The usual 64 hexagrams is created by overlaying the trigrams over one another to create a matrix of 64. It is interesting for me to find out that the American natives (Red Indians) also have a similar form of diagram. 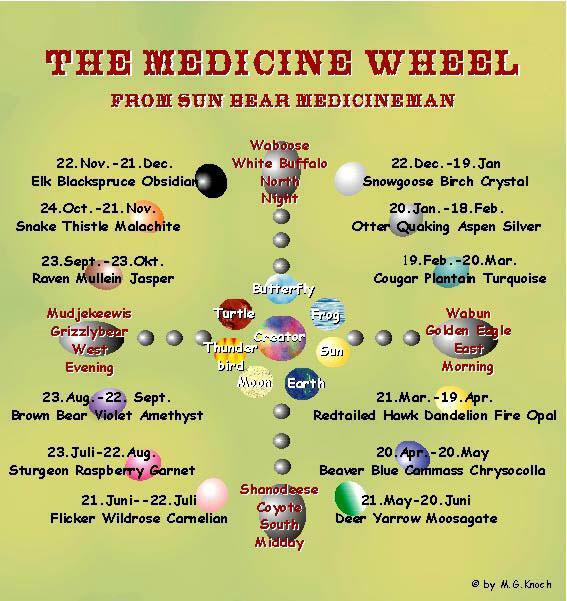 They call it the medicine wheel ( I recently discovered that the file is no longer available. You can get similar medicine wheel diagrams by a google image search on it – sample1, sample2). In the diagram, you can find storm, thunder, lightnings, fire, mountains, rivers, earth produces (e.g. wheat), moon and stars, eagle (God, Father-Sky) etc. The key teaching is similar to Yi Jing – balanced and harmony with oneself, God and the environment! By the way, the Chinese 8 trigrams, the Kan Water also represents the moon and Li Fire also represent the Sun. The medicine wheel is like a simplified form (less than 64) of hexagrams that teach how one should live in this world. This shows that the creation truth and order of life are opened to the discovery by man and many different races of people has grasped the essentials of them. The 64 Hexagram represent different situations or positions that we may find ourselves in. They also contain the principles of life. Some says they represent the 64 moral character or virtues. For each Hexagram, the original Yi Jing has a text descriptions of what it is and descriptions based on the pictorial (象) meaning (phenomenon). There are also 6 (爻) lines (full yang line and broken yin line) of text and pictorial descriptions. The six lines represent 6 stages of growth through time and positions within the hexagram. For position wise, the hexagram is drawn from bottom upwards. The 1st represents beginning,lowest position, 2nd is sprouting out of the earth, 3rd is initial success, 4th is entering next level, 5th is the highest success and the 6th is the ending and handing over and the highest position. Another related interpretation is 1 – move (birth), 2-enter(balanced), 3-depth(dense), 4-show out(shine), 5-stationary(rest), 6-substitute (changing). The 1st 3 lines or stages represent internal (under), and the upper 3 lines represent external(upper). The odd position lines, 1,3,5 represent Yang (activitor) and the even position lines 2,4,6 represent Yin (receptor). At the start, timing is more important than position and at the end, position is more important than timing. Another, to me less significant, meaning for the 6 lines is that they represent the different parts of a body. 1st, lowest line is toes, 2nd is foot, 3rd is waist, 4th is upper body, 5th is face, 6th is head. In summary, each hexagram represents a situation or state and within each situation, there is a 6 stage development. The principles and characteristics of state and stage transition are described very tersely in Yi Jing. Even so, there are much to be learned from them. Precisely because of the terseness, there are many books written to explain what Yi Jing means and how to use them. One can follow the interpretation of the Confucian Ru 儒-School, or one can follow, not recommended (as it leads to too much spiritual and mystical explanation and practices), the extension by the Dao school and the Taoist religion to the fortune telling and geomancy practices. There are much teachings on how the patterns of the Hexagram give rise to the textual description. In fact, scholar in Yi should know the how. A key reason is that by knowing the how, one can explain and develop the teaching of Yi better. For me, the descriptive text and its application should be useful enough. If you are a Christian like me, studying the Yi Jing help me to understand the Bible better. Most Bible expositions are made from the western thinkers’ viewpoints and tend to be, in my biased opinion, narrow and hard – either or, force it. But Bible truth is interestingly very eastern like. God is both love and just – either is partially wrong! The truth is to hold both concurrently like the Yin-Yang of Yi Jing. We can say Yin is love and Yang is Justice. The explanation of love given by Paul in 1 Cor 13 says that love does not rejoice at wrongdoing but with the truth. So love has justice inside and Justice has love within. i’ll have more comments to reflect – from this text that appeared somewhat qualitative n nothing quantitative….. but guess the warriors did not go round w calculators or computers in those days…..
we learned special relativity in the first year….. the jewish genius einstein happened to discover that – an event must happen if position (x,y,z) n time (t) coincide…..
u r saying here something contraversial to eistein’s law of physics – even if position n time is to coincide….. that represent only the heaven – earth – human intervention or people’s action w use of the i-ching wisdom cud change the event…… n it’s ideal so long as the people’s action goes in harmony w the environment heaven – earth…..
i must say it is interesting….. for me to go on reflecting by repeated readings of ur text – in future…..
putting the first point in paralell for a clear constrast….. now we find the missing people p dimension in the eistein’s formula – accepting that human heart is so unpredictable so said the chinese – it is interesting to see the chinamen use i-ching instead of a formula to predict changes to the outcome of an event by people’s action….. to express its modelling some other way…..
3rd point – i really appreciated the uni education i have been thru…… monash has lots of bright professors that were so eager to want to pour all latest knowledge to us….. instead of leading us to dwell into all the historical stuff for knowledge recycling – unlike melbourne u i supposed…. i am reflecting here – w/o affixing value or leballing anyone….. n insist on academic freedom w no politics….. while accepting the pros n cons of any a whole truth…..
Are you still working on this site? It’s tremendously helpful. Thanks. Yes. New understanding and discovery will be blogged at this site.